The first Aesop product I used was the Parsley Seed Antioxidant Serum and it was a great product, though nothing really exceptional in my opinion. I bought this, the Parsley Seed Cleansing Masque, a few months later when I spotted it in Japan. I was so happy! When I first used it, I didn’t notice anything drastic, so I didn’t really incorporate it in my regular routine. It wasn’t until I started getting tiny pimple breakouts (as in, a smattering of literal tiny pimples) that I began to see a difference. After using this mask—or lol, should I say masque?—I noticed a significant change in the clarity of my skin. My current skin care routine does keep the pimples at bay, but I owe it to this mask for getting rid of the plague of little dots on my face, particularly situated around my forehead area. If you’re unfamiliar with masks, you just basically use them every couple of days, or even weeks. It’s not something you should do everyday, though I can’t really tell you why. It’s just something that you don’t do everyday, like exfoliating. Anyway. You spread the Aesop Parley Seed Cleansing Masque all over your face, wait something like 15 minutes, and wash it off, et voila! A face like new. 🙂 It honestly changed my skin’s state, and it’s just so amazing to me how a little mask can do that. This little tandem has done wonders for my skin. I use the Serum more often than the cleansing masque, and it keeps my dry patches to a record low, and I’m so thrilled about that. My skin is much smoother now, and I have this little mask to thank. 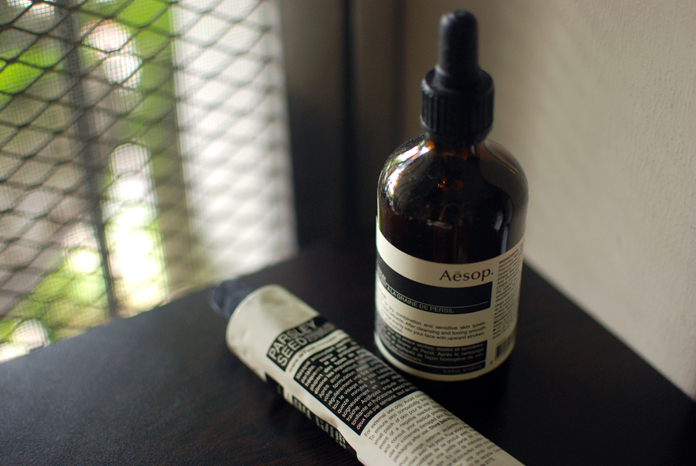 Aesop is cruelty-free. You can purchase Aesop products on Taste Central. What a coincidence! I was just telling Karen that I really really really want to try their fabulous face oil like… An hour ago :)) Then you posted this. Agh. Hahaha welllll. They are awesome. I’ll just leave it at that! I really need to get on the pamper Sunday movement and start exfoliating and using masks (or masques? haha) every Sunday. This looks like an interesting brand to try. I really need to get in on the Sunday pamper movement. I’ve never used exfoliators and masks (or masques? haha) before and I need to introduce these to my skincare routine. I think it’s easier to incorporate scrubs since the action is similar to general cleansing. 🙂 try it! Clearly, I am going through my reader since it’s been a while, but OMG – what happened to your ban? Was it modified or did it end? Will I find out as I keep reading your posts? I love the idea and packaging behind aesop but I always felt it was overpriced….I am going to have to check out the ingredient list for the mask and compare to my other masks. Nope, it’s still on! These are back logged products… Which explains my need to go on a ban! ahhhhhhhh – hahahahahaha – been there…. :) Still have new boxes of skincare product I haven’t even opened yet. i really want this! I think I had the same experience with some samples of this mask. helps alot with the tiny bumps!! Hee! I’m so happy. 🙂 definitely worth the money if you want to splurge on your skin care, IMHO.